This unique combination of visitor experience and sustainability creates a compelling story and educational opportunities for ‘Energy for Life’ Tropical House. Spanning two levels with fantastic vantage points, guests can experience face-to-face encounters with a diversity of wildlife and exotic plants in a tropical climate, while learning about the flow of energy through life. The groundbreaking project with cutting-edge technology features a woodchip boiler that will be supplemented by a specialist boiler capable of burning straw-based animal manure. This will provide heating for buildings across the zoo and enable the charity to reduce its carbon footprint and dependency on fossil fuels. The contemporary exhibit’s curved roof is built using the latest ETFE (ethylene tetrafluoroethylene) technology. 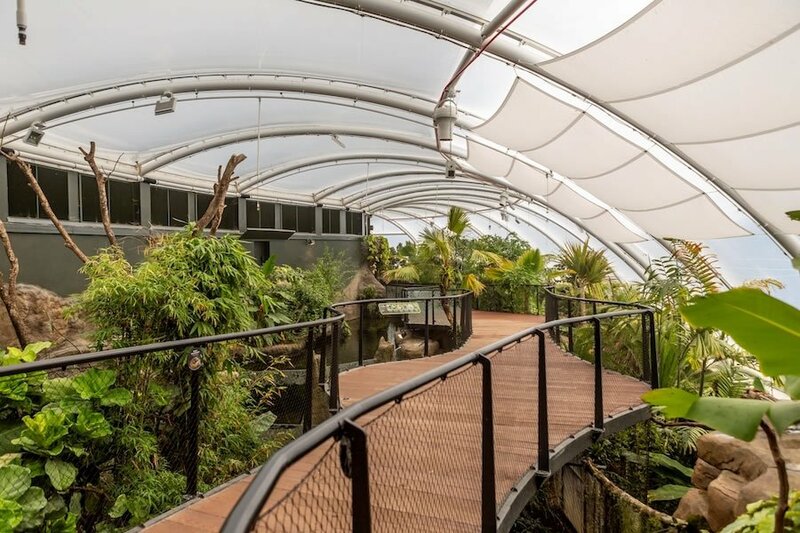 This insulating roof canopy allows natural light to shine through, creating ideal conditions for 650 individual plants from 65 different species to flourish and form a lush habitat for the animals. Rainwater from the roof is harvested in two 50,000-litre tanks to provide water inside for the aquaria and plant watering, making the building self-sufficient. Leading the way in sustainability, the zoo realised a significant untapped energy resource in some of its 700 tonnes of animal manure arising annually (dung, soiled bedding and leftover hay) that could be used for renewable energy within the zoo. Through the Tropical House experience, Marwell aims to encourage interest and understanding of the flow of energy through life, raise awareness of how the energy we need to power our modern lifestyles is generated and the consequences for the global environment. The exhibit highlights our changing climate, the measures Marwell is taking to reduce carbon emissions and how guests can make a difference. Supported by a £1.5million Local Growth Fund (LGF) investment by Enterprise M3 Local Enterprise Partnership (LEP), the exhibit is part of a 10-year, £17million investment plan to create improved habitats for animals, more immersive experiences for guests and to help the zoo achieve its goal of becoming carbon neutral by 2020. “The LEP’s involvement has itself been catalytic and in addition to their grant, has allowed us to understand and support a wider regional strategy of economic growth, STEM skills development and low carbon technology, all of which ‘Energy for Life’ will deliver upon.